As last night’s Yankees game ended, the fans erupted in cheer throughout the stadium but they had something more to cheer about than the impressive 8-0 which has been the rare diamond in a rough season. What they had which they had never seen before is Edwar Ramirez. A guy who being twice released from the California Angels organization had thought he’d seen the last of baseball. Growing up in the Dominican Republic, Ramirez was signed to a professional contract by the Angels when he was just a teenager. Back then he relied heavily on his fast ball and what he describes as a “not-very-good” slider. In his first season in the minors he split time between two teams in the rookie leagues within the Angels organization. There were growing pains. He started off decently but his numbers were flat. In 56 innings that year he put up a modest 4.66 ERA and struck-out 49 while walking 17, a decent but not sparkling start. The next season Edwar split his time between two Angels teams at the A and A+ levels. His team was not overly impressed by his paltry 1 - 3 record and 5.55 ERA. Seeing him pitch in just over 35 innings the team decided they had seen enough. At just 21 years of age, he was out of baseball. Having learned a new trick he got back on the track to the majors in an independent league and this time around he was quick to impress. In 62 innings he posted a 1.45 ERA struck out 93 and walked only 15. The Angels took notice again signing him to the team and sent the kid to AAA. It wasn’t for long however as he only pitched in a single game; albeit it was an impressive 2 perfect innings, things didn’t last past the spring of the next season. He reported to spring training and in his own words had the best spring of his life, but there must have been something the Angels didn’t like as they cut him yet again. Determined that he could pitch in the majors, Edwar again signed onto an independent league team. 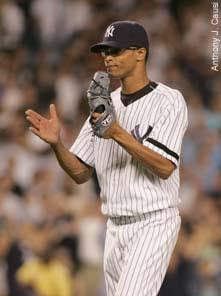 He wasn’t there long as he caught the eye of the New York Yankees after just 25 and a third innings pitched. During that span he posted an ERA of 1.07 striking out 46 and walking 10. The Yankees signed him July 9th and sent him to their Florida State League affiliate where he had a strong finish. He won 4 and lost 1 in 30.2 innings, striking out 47 and walking only 6. After raising some eyebrows early, he starts 2007 in AA but made an appearance in 9 games before he is moved up to AAA Scranton. Edwar’s efforts paid off this July when the Yankees called him up. He stood out so much they thought he could come in and relieve some of their bullpen struggles. He must have stuck out like a sore thumb this season; in 43.1 innings he struck-out 80 with a 0.62 ERA and to date has only surrendered 1 homerun while apart of the Yankees organization. Ramirez had been dropped from the sport he loved twice before, but that couldn’t keep him from making it and on July 3rd with the Yankees up 8-0 against the Twins manager Joe Torre brought Ramirez into the game in the 9th inning. He faced no easy task going up against the middle of the order including reining MVP Justin Morneau. With that devastating change-up he taught himself while being supported by his uncle, Edwar strikes-out the side in his major league debut.